Can you feel it… The nights are getting shorter and the days are getting warmer – Summer is here! Time to get looking at portable pools to spoil your family with. If you are dreaming of the days outdoors in the sun, splashing around with the kids and just enjoying the warmth on your skin, then we have exactly what you need. Spend your summer outside in a new, fun pool. 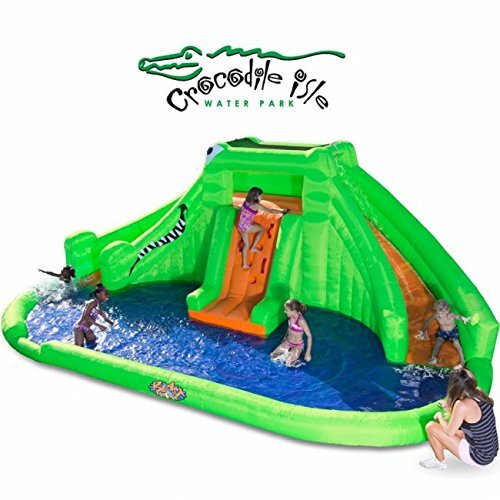 The kids will love being able to cool down and have some splashing fun. Portable pools are really ideal for many families. 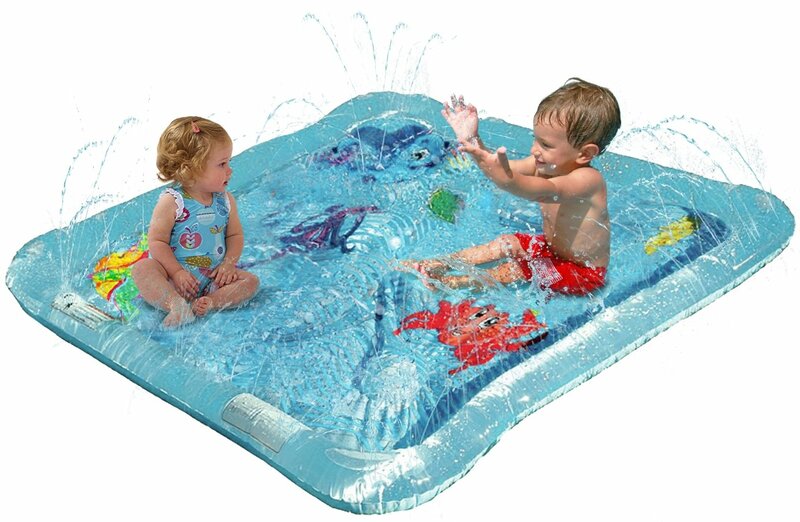 Instead of having a permanent pool to maintain, simply set up or blow up the portable pool whenever the weather is good. They don’t take nearly as much water as a permanent pool and don’t need as much attention either. Just drain the water when the fun is over, clean and store until the next sunny day. 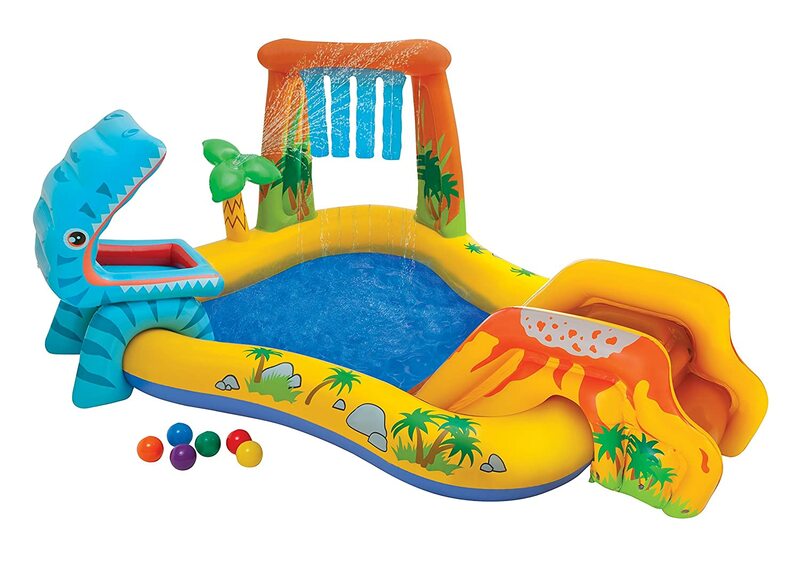 This is the perfect pool if you have a little one who wants to join in the summer fun. 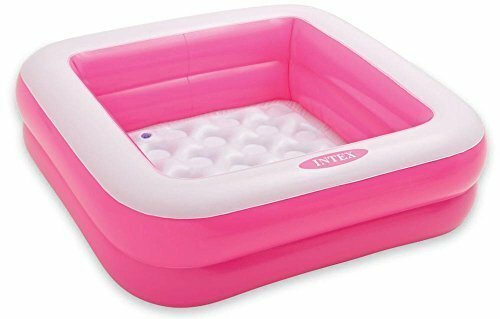 The Intex Baby Pool is made with 10 gauge vinyl with a soft inflatable floor, making it super comfortable for baby but still being strong and durable. The dimensions are 8.9×2.4x.8.1 inches, so the perfect size for a baby. Okay so we agree, this is a little bit extreme – but how cool is it! Your children will go absolutely mad playing in this all summer and your house will be the envy of the whole neighborhood. Kids can splash and play in their own private lagoon and slide down one of two slides. This quaint, colorful pool is perfect for the smaller ones in your family. The shade cover will protect them from the harsh rays and the pool is small enough to be safe for them. There is a drain plug to make for easy packing up. Intex have also included a repair patch because kids will be kids! Don’t you wish you had something like this when you were younger? It is a little explorers wonderland! 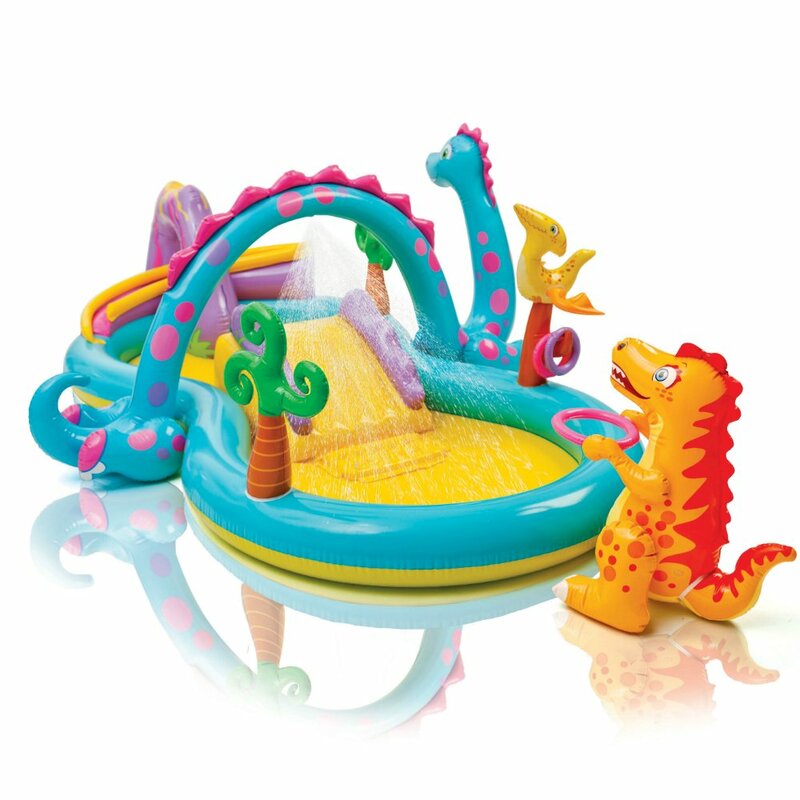 The Dino Arch water spray can be attached to a hose in order to continuously spray water at the kids. The soft slide and landing pad are both fun and safe for kids to enjoy. It is a colorful, adventurous pool for little ones to spend the day in. The perfect family pool. 90”x90”x26”, this pool has enough space to fit everyone in. It comes with four built in seats and even two drink holders. The 10 gauge seats add to the pools durability and comfort, and just in case there is a repair patch included. The whole family can all enjoy a day out in the sun, lounging and playing in this pool. Another Dino pool – this time water is sprayed down from the attached palm tree while water trickles down from the waterfall. The slide flows down to a soft landing mat, ensuring that it is soft and safe for smaller kids. The pool has a drain plug so it is easy enough to empty and pack away. As with other Intex pools, there is a repair patch included in case of any tears or scratches on the pool. 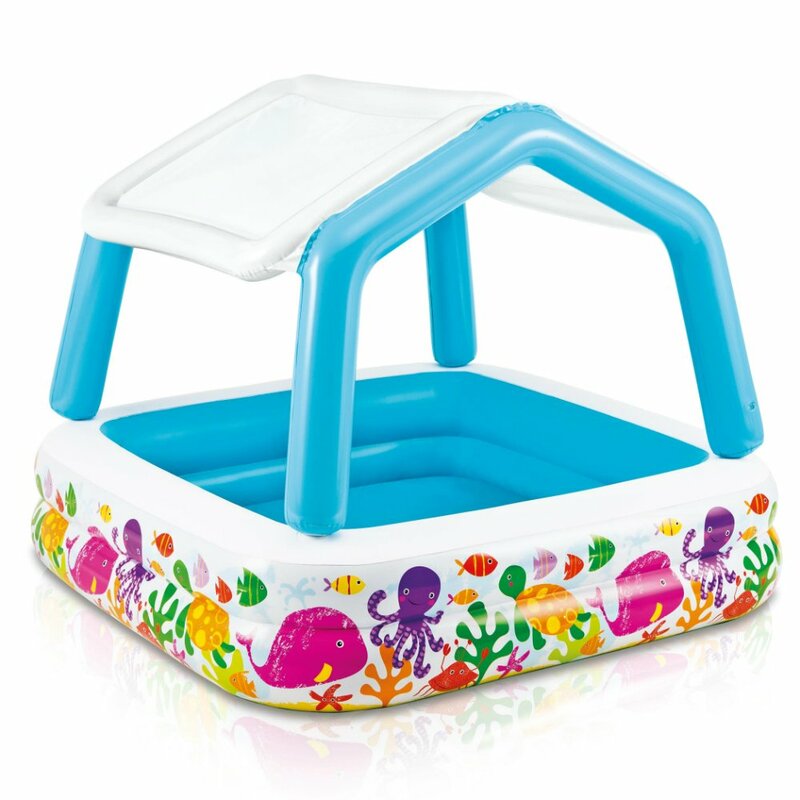 A little different to the conventional blow up pool, this baby friendly pool can be carried around in a bag and popped into shape when needed.The pool is perfect for use on the beach, where the pool can be sunk into the sand to give it shape. 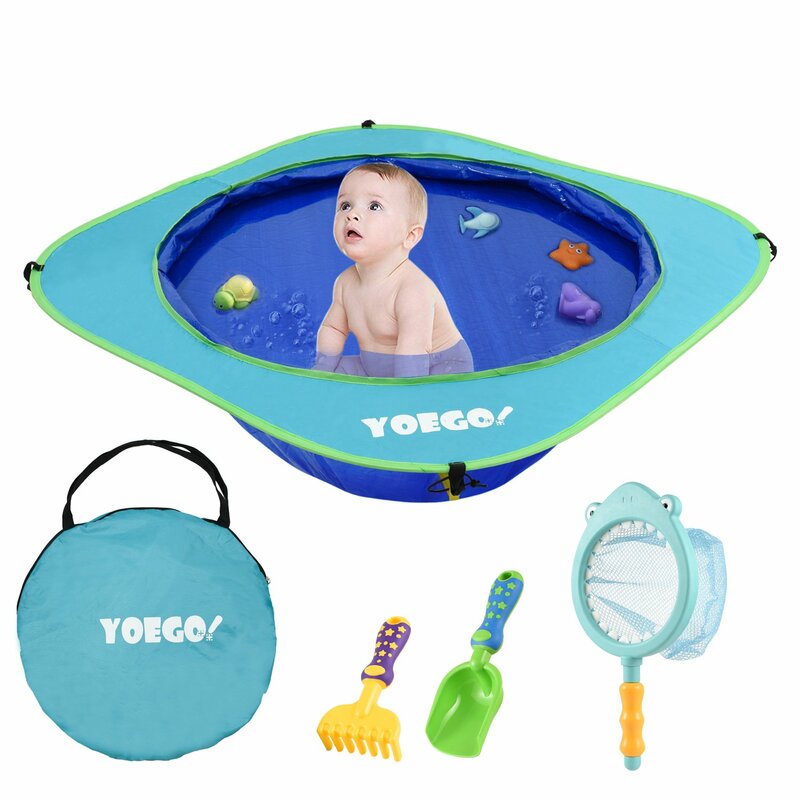 It allows your baby enough space to move around and splash, but is small enough to be safe. It comes included with a beach spade and rake, and even a sharky net. 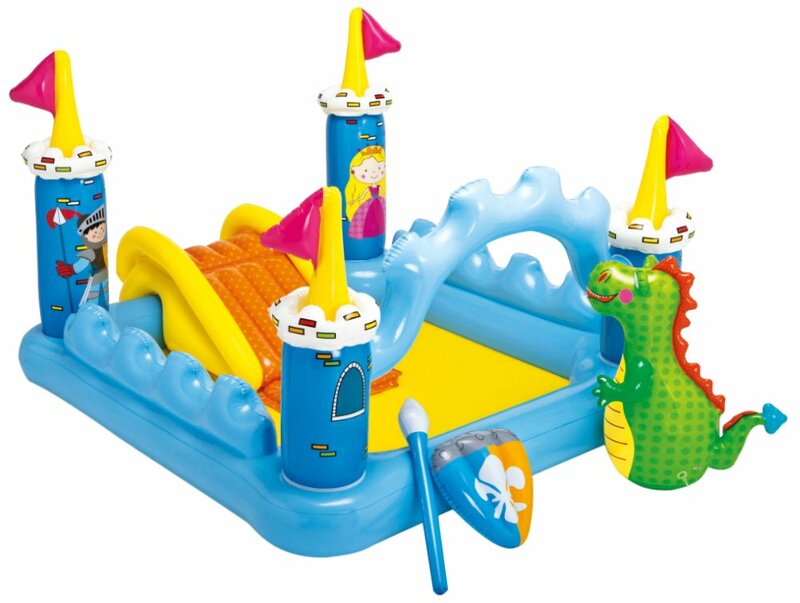 Your kids can slide into their very own castle, equipped with a friendly dragon and even shield and lance! A hose can be plugged into the dragon and he will spray water all over the pool. The imaginary play is so much fun for the kids and they can do it all while soaking in the sweet rays of the sun. How awesome is this – a pool and surf-slider all in one! Your kids will spend ages outside playing on this water crasher slide. The sliding ramp leads into a small splash pool that will break their speed. The Wave Crasher Water Slide comes with an inflatable body board that makes the perfect sliding action. This splash mat is every moms dream for their baby in those hot summer months. You won’t have to be leaning in to keep baby upright in a normal blow up pool. 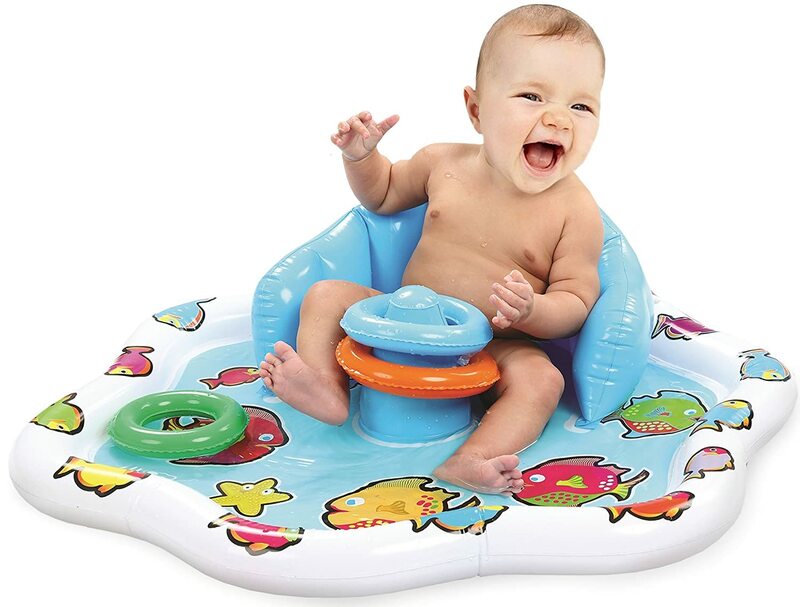 This mat comes with a built in baby seat that keeps baby upright while still being in the water. There is just the right amount of water for them to splash around in for sensory play and it comes with three inflatable rings to stack. It is a safe option for your baby this summer. This is a pool for the kids brave enough to swim with the sharks – or at least that is what they can pretend to be doing! 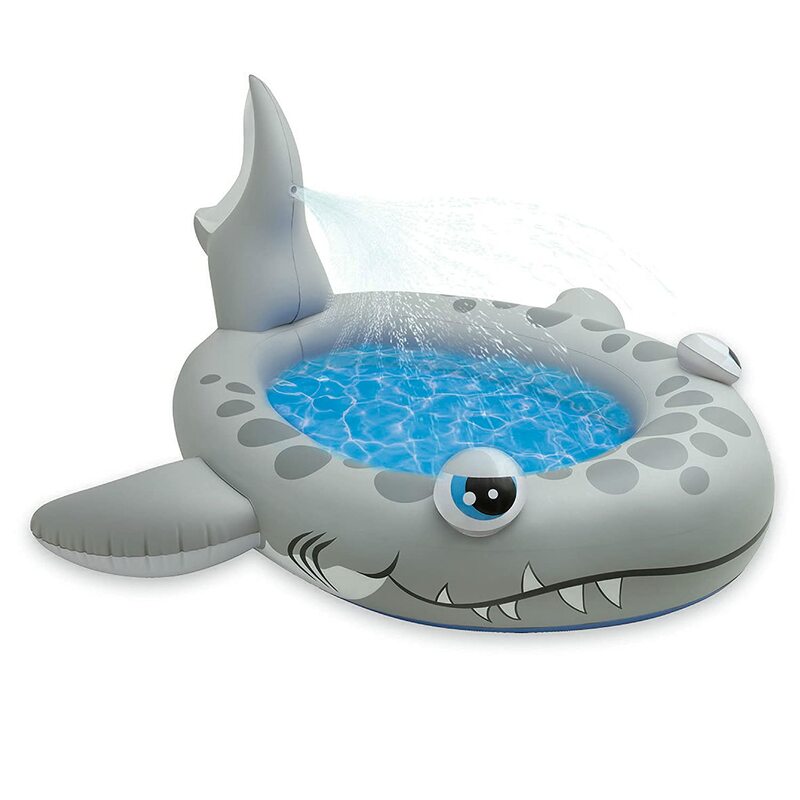 This sharky pool can be attached to the hose pipe to spray water out of the sharks tail, adding a bit of excitement to usual swimming time. It is safe and durable material, making it perfectly comfortable for kids and reliable for parents. This is the step up from the baby splash pool. 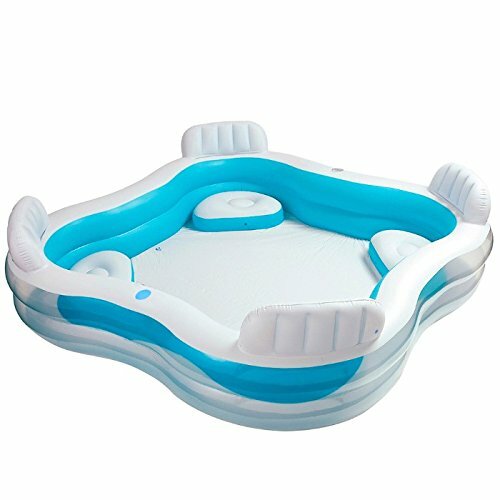 Able to accommodate more than one child at a time, this splash pool is for kids that can sit on their own, but aren’t quite ready for a big pool yet. The sprayers keep kids cool while adding some fun to the pool and the water filled sides give it a soft and protective frame. There are floating 3D fish that are brightly colored to keep little ones entertained. If the kids love to play together, then this is the pool for them. One can bounce around on the inflated sand castle while the other wades in the pool. 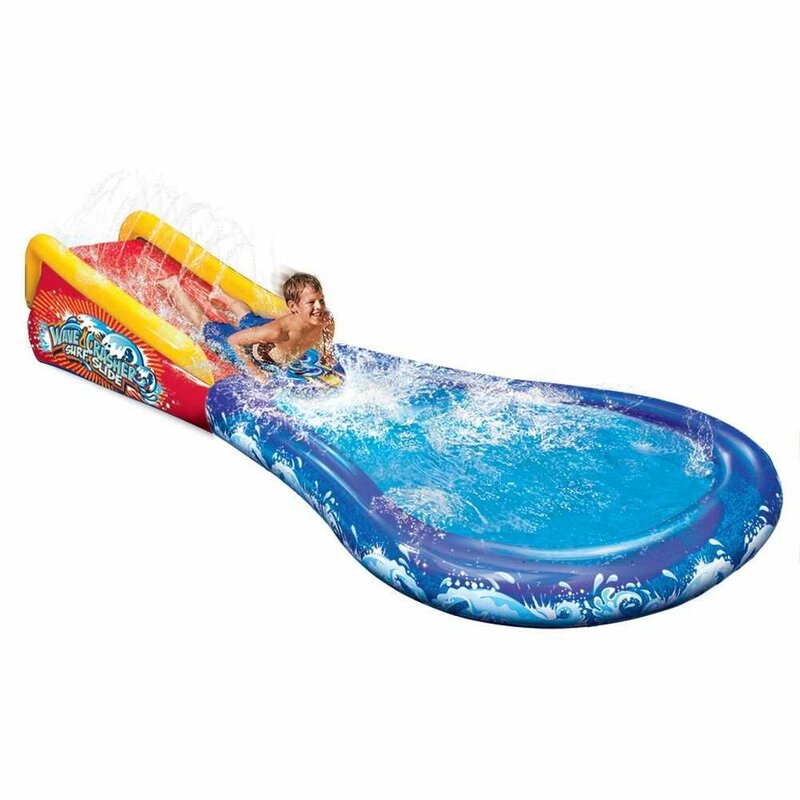 They can take turns on the connected slide and bounce and splash together all day. There is even a water sprayer to keep them coo! So there you have the most fun, colorful and family-friendly pools ready to keep you and the kids entertained all summer long! They are easy to assemble, easy to put away and most importantly super fun!